On 9 May 1891 the members of Royal Arsenal Football Club caused a sensation on the London football scene when they voted to turn professional. The governing body for football in London were staunchly amateur, heavily influenced by the “old boys” network of public schools. Royal Arsenal had been forced into this situation after losing a number of their players to the professional clubs in the Midlands and the North. Being the best club in London and the South had led to them becoming victims of their own success. 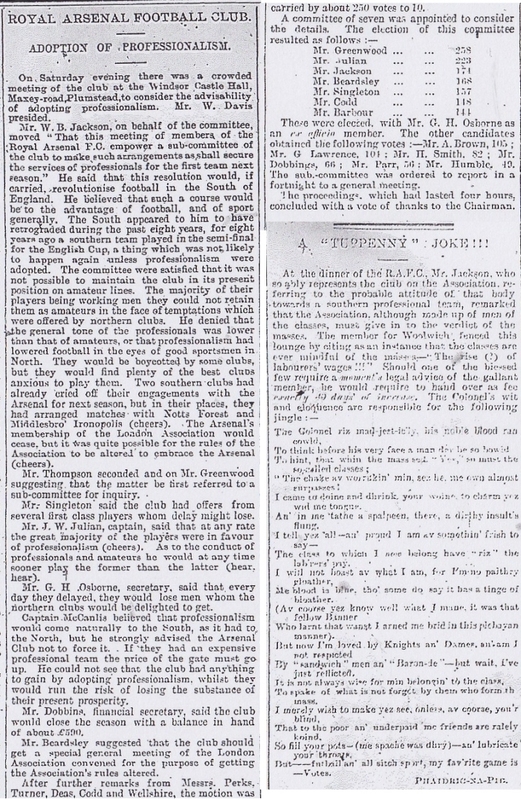 Rumours had been reported in the newspapers for some time, and on this particular date William Jackson, on behalf of the committee that managed the club, put forward a motion to adopt professionalism. This was carried by a huge majority of 250 to 10. The report of the meeting below is taken from the Woolwich Gazette on 15 May 1891. It may look long and a bit boring but it’s worth a read just to get a feel of how news used to be reported: plenty of facts and no tittle-tattle. This is because he didn’t say it at this meeting. His short speech came at the annual general meeting on 23 May 1891 and it was in response to the proposal that a limited company be formed to handle the club’s affairs. His view was that this was not necessary at this time, which is reflected in his words and makes more sense than it being in response to adopting professionalism. This is just one part of the story of Arsenal’s journey that saw them become the first professional team in London which was incredibly significant to football not just in the South but across the whole of England. The full story will be told in our forthcoming book – Royal Arsenal : From the Common to the Manor – which will be published later this year. Or have a look at our other site: The Arsenal Collection for loads of Arsenal memorabilia.